This handbook is designed to help jobbing histopathologists jog their memory and get through more workload in any working day. Rapid access is facilitated by a bullet-point, tabular and diagrammatic style, as well as by handy anatomical diagrams, guidance on the ‘Cut-Up’ with emphasis on core ‘datasets’ and by a special index for frozen section advice, grading systems and scoring systems. The book provides, where useful, differential diagnosis lists and presents diagnostically helpful molecular and immunohistochemical findings. Information is kept up-to-date on a dedicated website www.pathbook.com. 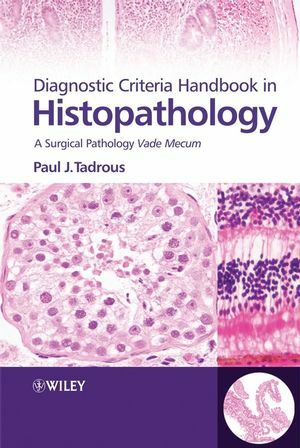 The Diagnostic Criteria Handbook in Histopathology is not designed to be an “exam cram” and neither will it serve as a basic text for beginners. Trainees, however, will still benefit from the sheer breadth of topics covered in this one small volume: from lab management and lab methods, to autopsy practice, cytology and all sub-specialties in surgical pathology. A chapter on exam technique and mnemonics makes the book also an essential companion for those revising for professional exams. So why clutter your precious desk space with multiple sets of heavy two-volume reference works? Give this handy Vade Mecum a place next to your microscope and see how much time you could save!